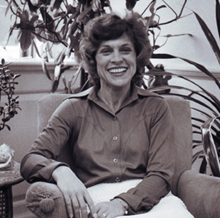 Dr. Patricia Wertheimer was the sixth principal of Dana Hall. She had a distinguished background in public education that added an exciting dimension to Dana. She was the principal of Princeton, New Jersey’s senior high school and while earning her doctorate in education from Harvard’s Graduate School of Education she was part of Harvard’s team of administrative career students who established a nationally known model high school program at the John Adams School in Portland, Oregon. She also taught at Academia Loyola in Mexico City and at the United Nations International School in New York. To Dr. Wertheimer, Julia and Sarah Eastman, the first principals of Dana Hall, were heroes. They struggled through childhood poverty, lost their mother at an early age, and took turns going to school while one took care of the household. They were probably terrified and filled with doubt as to whether their school would be a success. Each of these gentle, purposeful women affected the lives of their students; their beliefs and the decisions they made over a century ago still mattered a great deal in Wertheimer’s day. Dr. Wertheimer wanted her students to also be prepared to be heroes when challenges arose. She wanted them to make difficult but right decisions, to handle losses and disappointments as well as triumphs with grace, and to stand up for their beliefs. She knew that the traditional aims of a Dana education were still valid but no longer definitive. It was important to re-examine and redefine women’s roles in the family, in jobs, and in politics to allow Dana students to explore the widest possible range of available roles. Self-confidence, self-sufficiency, forthrightness, courage, and a sense of worth were qualities students would need in order to make wise personal choices and to participate effectively in group decisions in a drastically changing world (Wertheimer, On Heroes 5). In 1975, Wertheimer and the Board of Trustees decided, after evaluating the nine-week exchange with St. Paul’s that took place in 1970, that Dana’s long history as a school for girls should dictate its future. They felt that there was far more to lose than would be gained by coeducation. A girls’ school provided “unique opportunities for growth and leadership in the academic, athletic, and communal realms of school life” (Wertheimer, From the principal 2). Throughout Dana’s proud history, generations of girls learned “to consider themselves persons of competence with contributions to make to the world” (Wertheimer, From the principal 3). Wertheimer established a variety of programs to connect students’ education with the outside world. The Senior Apprenticeship Program, for example, was a vital part of her plan. It combined academic courses with a two to four day per week apprenticeship. Each girl had to earn her apprenticeship through a job interview with the prospective employer. Each apprenticeship incorporated skills developed through the student’s course work with her interest in a particular area. Participating students lived in special residence halls that could accommodate their varied schedules. No credit was given for the apprenticeships. Projects ranged from working at the Boston College Legal Assistance Bureau helping Spanish-speaking people with legal problems, to curatorial work at the Boston Museum of Fine Arts, to assisting a veterinarian at the Heritage Animal Clinic. Qualified seniors in the fall of 1974 were allowed to take college courses for college credit at Wellesley and Babson Colleges. Under the Intercultural Action Learning Program, juniors could spend a semester learning about another culture by living, studying, and traveling in Greece or Kenya. This program emphasized “learning by doing” and the students worked with local people, learning their crafts and customs and speaking a new language. Another program, Close Up, was a congressionally supported educational forum on the involvement of youth in government. This program took place in Washington, D.C. and included seminars, interviews and discussion sessions with leaders in all phases of the federal government. Out of the Close Up program came Political Discovery in Government Center, a course that introduced an exciting concept – Government Center as a classroom. Through cooperation with independent and state educational agencies and government workers, students and teachers from 30 schools in the Boston area participated in a three week intensive exploration of the Government Center area. It offered students “the opportunity to live the honored definition of our democracy: a government of the people, by the people, and for the people. The students learned first hand the importance of making choices and the way these decisions influenced others” (Political). Dana’s Medfield Project was the fieldwork portion of the Changing America course taught by John Spencer, where the students volunteered at Medfield State Hospital. This course focused on the practical and theoretical aspects of careers in social work or human services. It was featured at the National Council of Social Studies Teachers Annual Convention in 1974. At this convention four Dana students, Mr. Spencer, and the director of volunteer services of the hospital led a panel discussion on the project. The American Studies classes studied the 1964 civil rights killings in Philadelphia, Mississippi, and talked by conference call to the FBI agent who handled the case. The agent, John Proctor, shipped all of the court photographs and various other exhibits from the trial to Dana in order for the classes to study them. The students compared this case, where eight men were convicted not of murder but of violating the civil rights of three civil rights workers, and drew comparisons to the integration issues in Boston in the mid-1970s. Dr. Wertheimer accepted the challenge of leadership in the education of young women and felt that by maintaining the vital traditions of academic excellence, caring for the individual and the community, and being open to worthwhile and purposeful change, Dana students would be well prepared to successfully meet the opportunities and challenges in their future. “The Center for Expanding Education.” Dana Hall Bulletin Catalogue Issue35.6 (June 1974): 6. “Court Photos, Class Phone Dramatize Civil Rights Studies.” Dana Hall Bulletin 37.4 (June1976): 7. “Medfield Project Featured at Social Studies Convention.” Dana Hall Bulletin 37.4 (June 1976): 7. “Political Discovery in Government Center,” Dana Hall Bulletin 36.2 (October 1974). Wertheimer, Patricia. “From the principal’s desk,” Dana Hall Bulletin 37.3 (Winter 1976): 2-3. Wetheimer, Patricia. “On Heroes and Heroism.” Dana Hall Bulletin 42.5 (1981): 5. Wertheimer, Patricia. “A year of reaffirmation of purpose…” Dana Hall Bulletin 38.1 (Fall 1976): 2-3.